Traveling with kids is never easy. With short attention spans and boundless energy, it's common to find kids running around and sometimes even throwing tantrums at the airport. They will probably want to feel like a grown-up and carry their own stuff, but you can't exactly give them the same luggage that you're carrying, right? 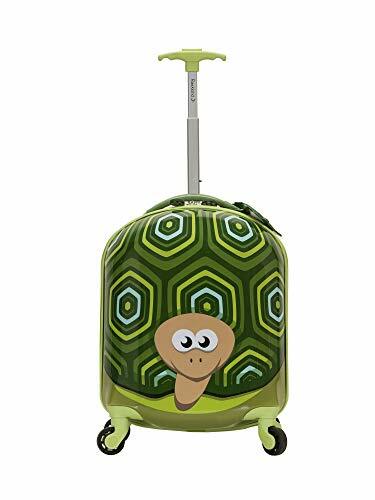 Luggage made for kids are not only functional but comes in fun and cute designs that no adult can get away with carrying. Whether you're traveling cross-country or just spending a night at grandma's here are the best kids' luggage you'll find that can turn any trip into one big adventure. Which Luggage Is The Best For Your Kid? Let's face it. One bag is never enough when you have your kid in tow, but it doesn't hurt if his luggage actually holds most of the things he needs. While it's easy to find a cute bag that can fit a weekend's worth of things, some bags are designed to be more fun than others. Some are cute enough to be toys, while others really take into consideration how much knickknacks kids tend to stow in their bags. It's also important for you to be able handle the luggage when your kid gets tired of pulling it himself. Look out for adjustable handles and straps that won't get you hunched over rolling tiny luggage through the airport. Pockets for kids luggage are rare. Since organization is done mainly by the parents, there aren't a lot of luggage options that offer internal and external pockets. This may or may not be an issue, but there are some bags with external pockets for smaller items. If there are no pockets, some options come with a matching backpack for quick access items. Material is important to know whether your luggage will last through the year. 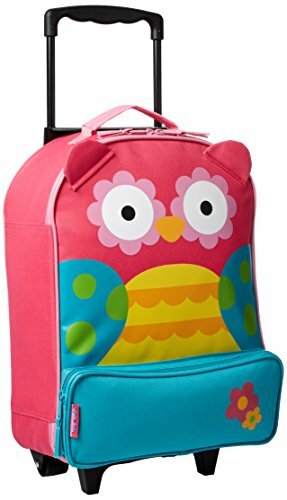 Many kids luggage pay a lot of attention to being cute and fun in terms of prints and designs. However, it's still important to check high quality materials not only of the luggage but also the hardware used. Your kid won't be as careful as you when handling his own luggage, so kids luggage actually have to endure a lot more beating than the regular luggage. 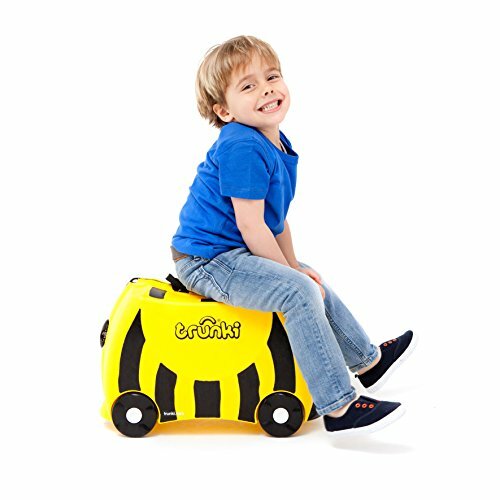 Make traveling feel like play with Trunki. The award-winning British design is both functional and fun. This luggage packs a whopping 55 liters giving more than enough space for your kid's clothes, books and toys. The hard-wearing but lightweight plastic material also gives excellent protection even if you fill this bag with milk bottles and liquids. Perhaps the most attractive part of this luggage for both you and your kid is the design. It comes in six different animal characters with fun colors and short back stories. All characters are fit as carry-on at 12.8 x 18.4 x 8 inches. While it's mainly built for air travel, the real fun begins when you're done packing and you're ready to roll. The luggage comes with two carry handles, but the top is curved to serve as a seat for your kid. Kids can roll this bag with their feet and steer the luggage with the horn handles. If your tiny tot is too tired (or bored), you can attach the shoulder strap with a built-in ID key and tow your kid and his luggage around. When you open up the bag, one side has compression straps to keep items from spilling out. The opening is also lined with soft foam to protect tiny fingers in case the luggage closes by accident. There are internal pockets to organize the many items you'll fit in the bag. The snout is also a secured latch to ensure safety of your luggage. The luggage can also hold up to 75 lbs of weight, so even without a trip, your kid can just use it as a toy and zoom around the house. The biggest problem with this luggage is the hinge. It's a simple clamshell design with the lid attached with a C-clip instead of a hinge. It's not easy to open the luggage and close it quickly as the C-clip gets dislocated, which means you'll have to open the luggage fully and align the C-clip before you can close it again. The latch is also very stiff and will be difficult for your child to unlatch it, which may or may not be a good thing. Every big adventure needs a tough and sturdy companion. 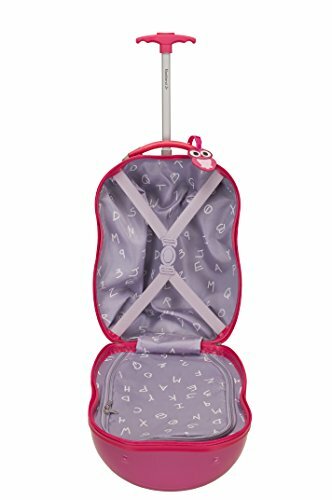 Heys America Travel Tots Kids Luggage are sturdy and durable and fit for any kind of travel for kids. 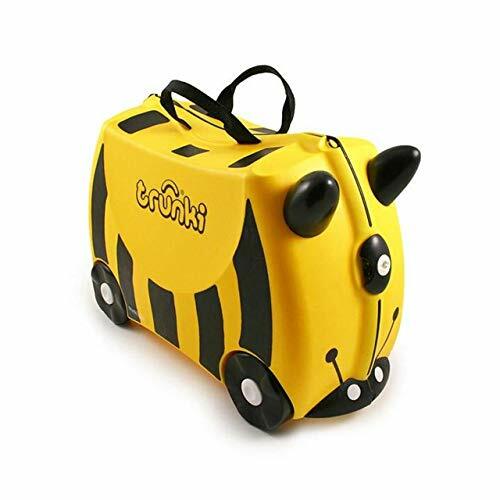 The roller luggage come in adorable animal characters with a matching backpack. This way, your tiny tot can leave his luggage behind and carry around daily essentials when you're read to tour the city. The ABS/Polycarbonate composite materials for both luggage and backpack can weather any kind of abuse, especially when kids decide to use this as a toy. The luggage measures at 18.2 x 14 x 8.8 inches, making it an ideal carry-on item for air travel. Both bags open with all-around zippers. The luggage has large in-line wheels to manage different kinds of terrain. There are x-straps in the main compartment to keep items from spilling out. When open, the luggage can still stand up straight making it easy for you to slip in some last minute items without having to open the entire bag. The backpack has a polyester lining and is very easy to carry. It also comes with a grab handle at the top. There are no built-in security measures or locks, but zippers for both bags have loops where you can thread your own lock. It lacks organization options, however. There are no internal or external pockets to keep small items segregated. 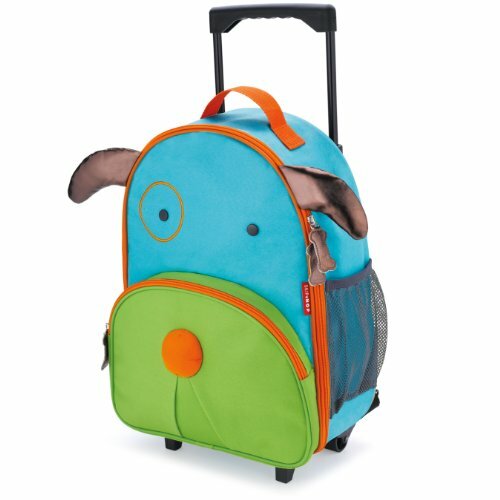 With fun colors and little details to play with, the Stephen Joseph Character Rolling Luggage is a great choice for imaginative kids. The Polyester material means it won't scratch or dent easily. It's also safe to wash the bag with soap and water for the inevitable stain. The lid opens with a zipper to reveal one main compartment. It's a straightforward storage with no straps and no internal pockets. At the front, there's an external pocket where your kid can stuff in little knickknacks. The luggage wheels are small and tucked well under the compartment. You can let your toddler roll this around without accidentally tripping himself on the wheels. It's a little smaller than usual making it more like a backpack on wheels. 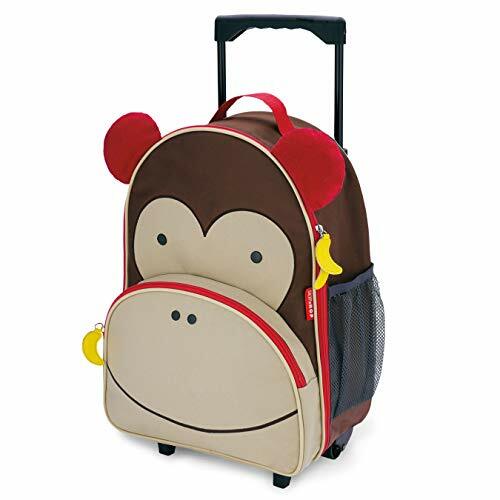 The Skip Hop Zoo Little Kid Luggage is a great option for little travelers. 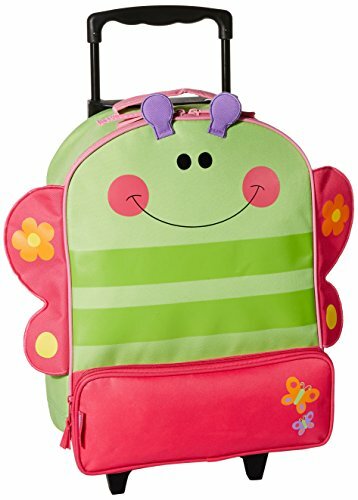 This pint-sized luggage comes in fun characters with fun details. Each luggage has floppy animal ears and zipper designs to match. With a 13-inch retractable handle, toddlers will have no problem rolling this bag themselves. At 7 x 12.5 x 18 inches, it's a decent size for overnight trips and as carry-on luggage for air travel. It also has a large front pocket that can hold snacks and pens or coloring books. On the side is a mesh pocket for a water bottle or anything else you'll need to carry around. In consideration to parents running after their kids, the luggage comes with a detachable back strap for convenient handling. You can sling this over your shoulder and carry the bag around after your toddler inevitably gets tired of pulling it himself. It's also convenient if you have to bring this up stairs or through rough terrain. Whatever the reason, you won't have to hunch down to the height of your kid to help him bring this bag around. If you want to complete the look, there are also matching lunch packs, neck pillows, and backpacks to go with your luggage. The poly-canvas fabric is low maintenance and keeps the luggage lightweight. However, some of the materials seem to be thinner and of less quality. The mesh pocket tends to break after a while when holding water bottles. If handled roughly, some design elements like ears and eyes also tend to break. Spinner fans, rejoice! Your tiny tot can look like a savvy traveler with Rockland Jr. My First Luggage. 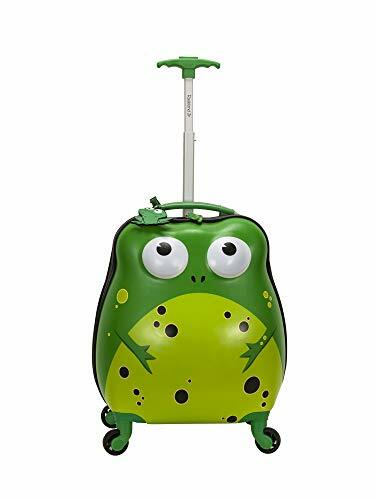 With different characters and luggage shapes, this is a great spinner option for kids to easily roll through long airport halls. The hardside style and polycarbonate material mimics adult luggage except with much cooler prints and colors. The single telescopic handle can be adjusted to two heights so both you and your kid can roll the luggage with ease. The 360 degree spin wheels make this very maneuverable as well. Most adult-sized spinners have trouble going through rough terrain, but since the Rockland Jr. is very light, it can easily go through stairs, rubble, cobblestone and dirt. 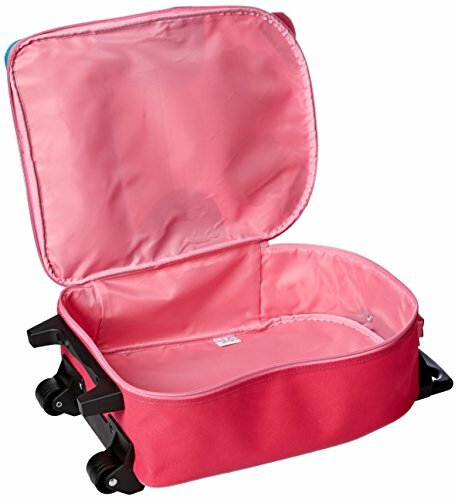 The luggage is very sturdy and can take a lot of airport or travel abuse. A great feature of this bag is its compartment. One side has an x-strap to contain your items, while the other has a zippered divider. 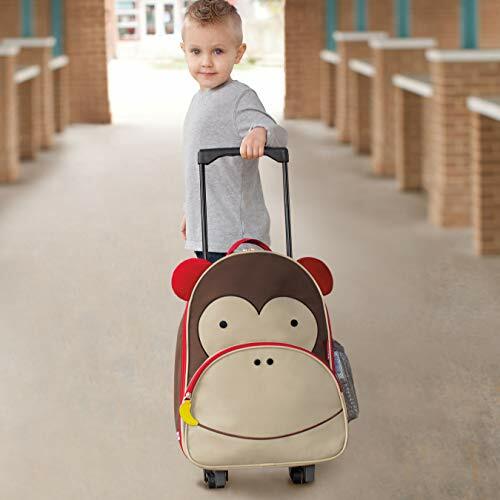 The polyester lining also features fun designs so your kid can enjoy every bit of his luggage. It opens with an all-around zipper for easy access, and the bag stays upright even with the front lid open. The zippers also overlap so you can thread your own lock through them. It also comes with a matching ID tag. It would have been great if it had internal and external pockets, but there are no other organization options than the main compartments. If every inch counts when you pack, then the handle might give you a problem. It goes through the back compartment of the luggage, protruding towards the inside and taking up some packing space. 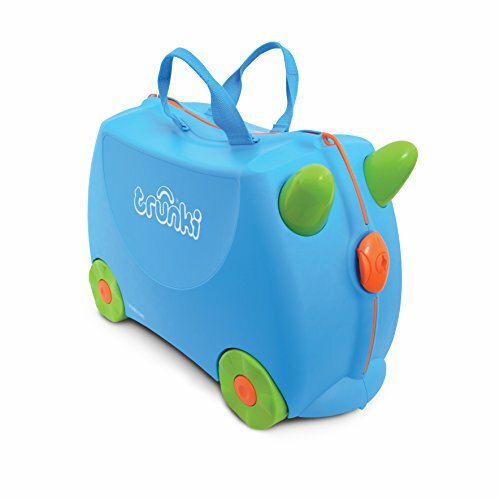 A crowd favorite has always been the Trunki luggage. This is literally getting a bang for your buck. It has a lot of space and capacity to hold clothes and toys, and it can be a real toy itself that will keep your kid entertained for a while. It's very sturdy but still light, making it the most ideal luggage for any kid and for any kind of adventure. BOREDOM BUSTING - Sit-On, Ride-On, Carry-On; keep toddlers entertained through the airport, at destination and away from home. A great "adult" luggage is the Rockland Jr. My First Luggage. It has most of the design features of typical hardside luggage. Spinner wheels also make it easy to manage through airports and roads. The adjustable telescopic handle is ideal of both kids and adults and will make this luggage a breeze to use. If you really need the extra space, the Heys America Travel Tots Kids 2 Pc Luggage Set is a great bundle. The designs are cute but the space is functional. You can load all the clothes in the luggage and stuff all the small and personal items in the backpack. Both are lightweight and your kid won't have trouble walking around with both backpack and luggage in tow. MATERIAL: We provide Classic Designed and gorgeous new Easy to Carry Heys America Kids 2 Pc Luggage Set. Both Luggage and Backpack made of ABS / Polycarbonate composite. Backpack has polyester interior. SIZE & WEIGHT: Ideal size for Easy to Carry and 18" Luggage weighs only 3.5 lbs & 13" Backpack weighs only 1.2 lbs. For its medium size, it is flexible to carry and packaging. It should be manageable for most kids. Head on to Amazon to get these bags at discounted prices. With cute designs and great builds, you'll probably have just as much fun as your kid!